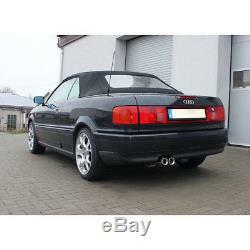 Fox sport exhaust audi 80/90 type 89 b3 sedan / coupe / 80 b4 convertible 2 x. This product page has been automatically translated. If you have any questions, do not hesitate to contact us. Product Page zinit solutions gmbh. Work hours from Monday to Friday 08:00 18:00. 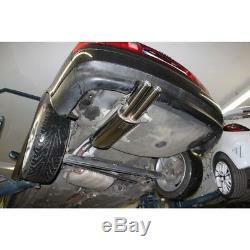 Fox sports exhaust system audi 80/90 type 89 b3 sedan / coupe / 80 b4 cabrio 2 x 76 mm. If you have any questions about our products, processing etc. Contact us by email or phone. 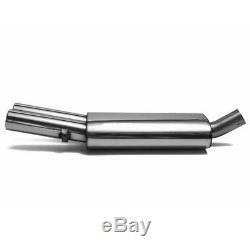 Fox sports exhaust silencer stainless steel for mounting on the original central silencer tube diameter: 63.5 mm 2 outputs: 76mm curved, straight, with absorber (type 13) suitable for. 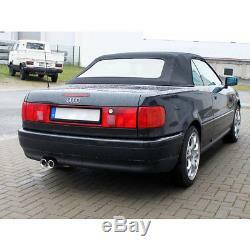 Audi 80/90 type 89 b3 sedan / coupe / 80 b4 cabrio. 1.8 l (92kw) 2.0 l (85 kw) 2. 0 l 16v (103 kw) 2.3 l (98 kw) 2.6 l (110 kw) 2. 8 l (128 kw) 1.9 l td (66 kw). Notes: only combined with an appropriate adapter: warning. Au011020-ad1 - for 1.8 l 2. 0 l (85kw) / 1. 9 l td au011020-ad2 - for 2.3 l au011020-ad3 -for 2. 0 l 16v (103kw) / 2.6 l / 2 Made of high quality stainless steel - with this approval (abe, no registration required) - including mounting accessories required. Manufacturer's reference information - fox exhaust. 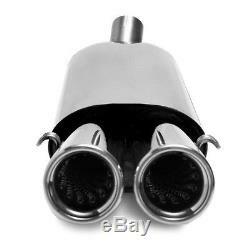 Fox Exhaust Systems is one of the leading manufacturers of sport exhaust mufflers. 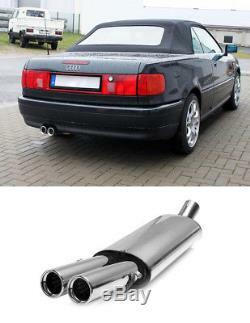 Fox sport exhausts are developed and tailored to the individual needs of the vehicle. Sport exhaust fox are made from high quality components, which are made of stainless steel v2a (1: 4301). Each fox sports escapement is distinguished by its excellent shape. In addition to the sound sport fox can be obtained in most cases an increase in performance. The exhaust outlets of the fox silencer are polished by hand work for high gloss. Most fox sports exhausts and all outlets are dekra / tuv tested and EU / Abe certificate delivered. Important Note: Unless otherwise noted, fox sits first on standard or silent muffler / exhaust pot can be mounted. Pre- or muffler / muffler exhaust fox systems do not match, but in combination with the original silencer end. List of driving vehicle applications. This article can be used inter alia for the following vehicles. 90 (89, 89q, 8a, b3). 04.87 - 07.91. 04.90 - 07.91. 04.87 - 09.91. 0 1.9 7 - 08.00. 06.93 - 08.00. 05.91 - 07.94. 06.95 - 08.00. 1 1.9 2 - 08.00. 06.95 - 07.96. 0 1.9 3 - 07.98. 10.88 - 07.94. 08.90 - 07.91. 03.09 - 12.96. 05.89 - 12.96. 08.92 - 12.96. 03.90 - 12.96. 09.91 - 12.96. Upon receipt of the total amount, your merchandise is ready as soon as possible. Take advantage of our favorable delivery conditions and pay your order upon receipt of the goods directly from the delivery service. Please note that additional charges apply for this service. This number is only for deliveries in Germany + if necessary possible from Austria. On purchase on invoice, you take no risk. This number is available for customers from Germany. Is the bill for a lump sum too high? Our santander partner bank offers favorable conditions. To determine the maturity and the height of the tariffs. This number is only available for customers residing in Germany. Important - they ask us to do it before buying! Please help us keep our prices low, leaving us a 5 star rating. Neutral or negative feedback does not solve the problem! We thank you for your support! 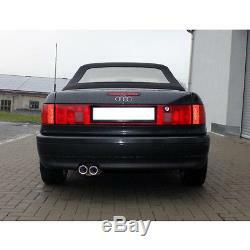 The item "fox sport exhaust audi 80/90 type 89 b3 sedan / coupé / 80 b4 cabriolet 2 x" is on sale since Thursday, August 2, 2018. 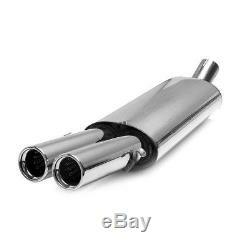 It is in the category "auto, motorcycle parts, accessories \ tuning, styling \ exhausts \ silent. " The seller is "www_sportauspuff-direkt_com" and is located in Chemnitz. This item can be shipped to the following country: europe.